Florus, deacon of Lyons (d. 860), was one of many early medieval authors to write commentaries on biblical books. In this manuscript the sources from which he draws his comments are marked in the margins. 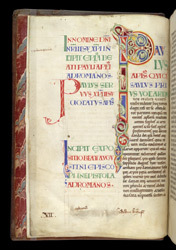 The decoration and script page are typical of manuscripts produced at Rochester c.1110-1130. In the lower margin of this page is a typical (but partially erased) Rochester ownership inscription. It names Baldwin, who was archbishop of Canterbury from 1184 to 1190, and who therefore cannot therefore have been its donor, unless it had been alienated, and he was responsible for its return.